FILE - A traditional dhow floats in the Corniche Bay of Doha, Qatar, Jan. 6, 2011. Saudi media reported April 9, 2018, a proposal to dig a maritime canal along the kingdom's closed border with Qatar, turning the peninsula-nation into an island and further isolating it. Saudi Arabia could consider a proposal to dig a maritime canal along the kingdom's border with Qatar, turning the peninsula-nation into an island and transforming its only land border into a military zone and nuclear waste site, state-linked Saudi newspapers reported Monday. The project has not been given official approval and faces many obstacles. Still, the proposal signals a new low in the 10-month-old feud between Qatar and a quartet of nations that includes Saudi Arabia, the United Arab Emirates, Egypt and Bahrain. The four accuse Qatar of sponsoring terrorism because of its support for Islamist opposition groups in the region and its warm relations with Iran. Qatar denies the allegations and says the moves attempt to undermine its sovereignty. Qatar's ruling emir, Sheik Tamim bin Hamad al-Thani, met in Washington on Monday with U.S. Defense Secretary Jim Mattis. He is scheduled to meet President Donald Trump on Tuesday. 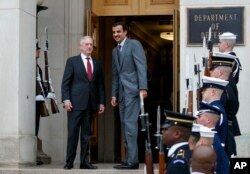 Defense Secretary Jim Mattis, left, stands with Emir of Qatar Sheikh Tamim bin Hamad al-Thani during an Honor Cordon at the Pentagon, April 9, 2018. Saudi Arabia's Sabq and al-Riyadh newspapers carried nearly identical reports Monday saying that under the proposal, Saudi Arabia would transform part of its side of the border with Qatar into a military base and another area would become a dump site for waste from nuclear reactors the kingdom wants to build. The UAE, meanwhile, would also build a nuclear waste site at the closest point near its border with Qatar. An earlier report by Sabq newspaper ran with a headline saying the canal project would "turn Qatar into an island" and would take just 12 months to complete. The so-called Salwa Marine Canal project would be funded by Saudi and Emirati investors and dug by Egyptian companies with experience in the Suez Canal. Sabq reports the canal would span the entirety of the border with Qatar, creating waterfront coastline for resorts, private beaches and Gulf cruise liners. The canal, estimated to cost 2.8 billion riyals ($750 million), would stretch 200 meters (656 feet) wide and up to 20 meters (66 feet) deep. Emirati Minister of State for Foreign Affairs, Anwar Gargash, became the first high-ranking official to comment on the proposal. In a string of tweets, he said the project is "proof of Qatar's failure to manage and solve its crisis" and that Doha's silence on the canal project "is proof of their fear and confusion." Qatari government spokespeople did not immediately respond to a request for comment. The quartet has imposed a de facto blockade of Qatar since June. Saudi Arabia sealed shut Qatar's only land crossing, cutting off a key route for food and construction imports. The four nations also expelled Qatari nationals and called on their citizens in Qatar to leave. They have barred Qatari flights from using their airspace and have supported alternative members of the ruling al-Thani family in exile.